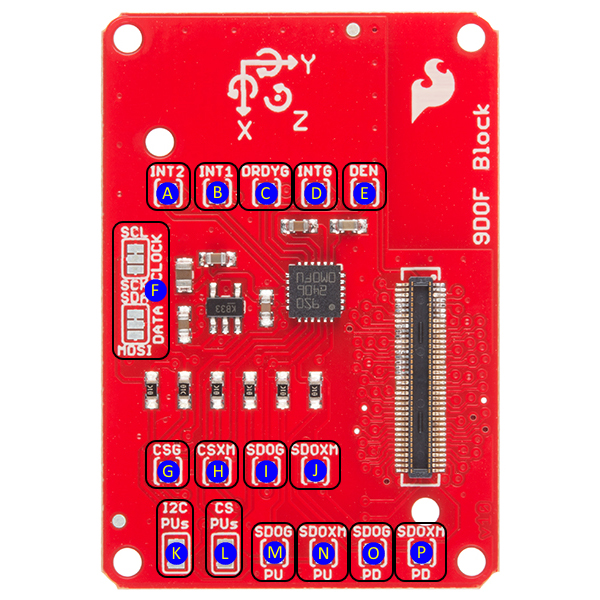 The 9 Degrees of Freedom Block for the Intel® Edison uses the LSM9DS0 9DOF IMU for full-range motion sensing. Use this Block to determine orientation, acceleration, and compass headings. The LSM9DS0 combines a 3-axis accelerometer, a 3-axis gyroscope, and a 3-axis magnetometer. The IMU is connected to the Edison through the I2C bus. A (INT2) - Accelerometer/magnetometer interrupt 2. This pin can be configured to change on a number of different conditions. See datasheet pp 58 and 65-67 for more details on configuring the device. Closing this jumper with a solder blob connects the INT2 pin on the LSM9DS0 to GPIO 49 on the Edison. B (INT1) - Accelerometer/magnetometer interrupt 1. This pin can be configured to change on a number of different conditions. See datasheet pp 58 and 63-65 for more details on configuring the device. Closing this jumper with a solder blob connects the INT2 pin on the LSM9DS0 to GPIO 48 on the Edison. C (DRDYG) - Data Ready, gyroscope. Closing this jumper connects the pin to GPIO 47. See datasheet page 43 for information on configuring this pin. D (INTG) - Gyroscope interrupt. This pin can be configured to change on a number of different conditions. Closing this jumper will connect the pin to GPIO 46. See datasheet pages 43 and 47-50 for information on configuring this pin. E (DEN) - Data enable, gyroscope. Enable or !pause data collection. This pin can safely be ignored. Closing this jumper allows processor control of data collection via GPIO 165. F (CLOCK/DATA) - I/O interface selection jumpers. Default setting is to I2C1 but cutting the small trace visible between the two upper pads of each jumper and closing the bottom two pads with a solder blob allow the user to route control to SPIDEV2. SPI is currently an unsupported feature and will likely be removed from a future revision. G (CSG) - SPI chip select, gyroscope. Closing this jumper connects the signal to GPIO 111 on the Edison, which is FS0 on SPIDEV2. The CS pin can be either handled manually or by the driver. SPI is currently an unsupported feature and will likely be removed from a future revision. H (CSXM) - SPI chip select, accelerometer/magnetometer. Closing this jumper connects the signal to GPIO 110 on the Edison, which is FS1 on SPIDEV2. The CS pin can be either handled manually or by the driver. SPI is currently an unsupported feature and will likely be removed from a future revision. I (SDOG) - SPI serial data out (MISO), gyroscope. SPI is currently an unsupported feature and will likely be removed from a future revision. J (SDOXM) - Serial data out (MISO), accelerometer/magnetometer. SPI is currently an unsupported feature and will likely be removed from a future revision. L (CS PUs) - Pull-up resistor removal for SPI chip select lines. Normally pull-up resistors should be left in place. SPI is currently an unsupported feature and will likely be removed from a future revision. M (SDOG PU) - Closed by default, this pin sets the I2C address used by the gyroscope. When closed, the gyroscope's address is 0x6b. When open, jumper SDOG PD (labeled 'O' above) must be closed. N (SDOXM PU) - Closed by default, this pin sets the I2C address used by the magnetometer/accelerometer. When closed, their collective address is 0x1d. When open, jumper SDOXM PD (labeled 'P' above) must be closed. O (SDOG PD) - Open by default, this pin sets the I2C address used by the gyroscope. When closed, the gyroscope's address is 0x6a. 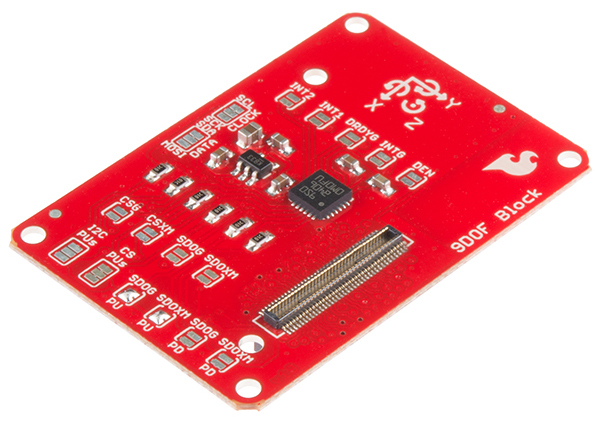 P (SDOXM PD) - Open by default, this pin sets the I2C address used by the magnetometer/accelerometer. When closed, their collective address is 0x1e. To use the 9 DOF Block simply attach an Intel Edison to the back of the board or add it to your current stack. 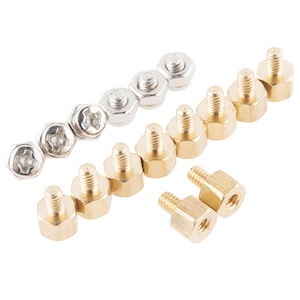 Blocks can be stacked without hardware but it leaves the expansion connectors unprotected from mechanical stress. NOTE: The 9 DOF Block does not have console access or a voltage regulator. It is recommended to use a console communication block in conjunction with this block like ones found in the General Guide to Sparkfun Blocks for Intel Edison. We're assuming that you're using the Eclipse IDE as detailed in our Beyond Arduino tutorial. If you aren't, you'll need to read over that tutorial to get up to speed. Follow the instructions in the programming tutorial to create a new project named "SparkFun_9DOF_Edison_Block_Example". Once you've created the project, open the project files on disk (hint: you can find the path to the project by choosing "Properites" from the project menu), and copy the three source files found in the Edison 9DOF Block CPP library GitHub repository into the "src" directory. Everything you need to know is in the comments. //  on; you may not need to do more than call it. It also returns the "whoami"
//  the .h file for all scales and data rates; I won't reproduce them here. //  crap within that ~10ms sampling period. //  rate as magnetometer data. //  to check for overflow per device. //  a sample and not know it. // Print the unscaled 16-bit signed values. // Print the "real" values in more human comprehensible units. //  temp sensor is probably best not used if local temp data is required! Now that you have had a brief overview of the 9 DOF Block, take a look at some of these other tutorials. These tutorials cover programming, Block stacking, and interfacing with the Intel Edison ecosystems. 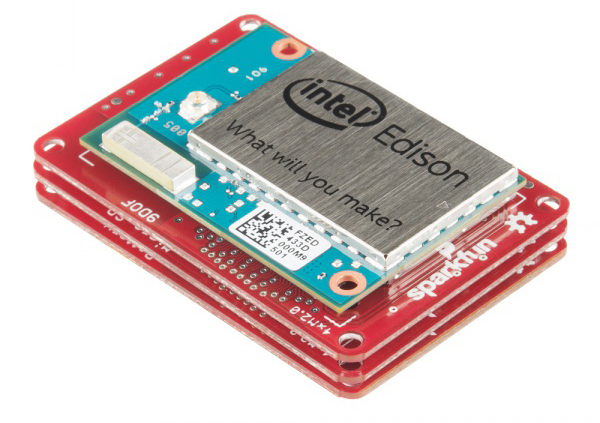 Intel's Edison module goes beyond being just another Arduino clone. Check this tutorial for advice on how to get the most out of your Edison by writing code in C++! Turn the Intel® Edison into an access point that serves a simple browser-based game. High scores from the game are displayed on a character LCD.